Launched on the last day of June, the Codecasa F73 is the first hull of the new Vintage series. 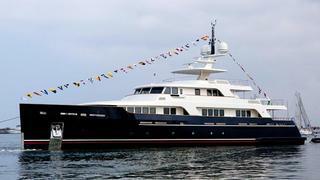 Lloyd's registered and MCA compliant, the first Codecasa Vintage has a length of 42.50m. She's built in steel and aluminium to a design by Franco & Anna Della Role, taking her inspiration from classic and traditional glories of the past. Her beautiful sleek silhouette is reinforced by the fact that there is no full-beam section on the main deck and the presence of a vertical bow. The interior, dominated by light colours, accommodates 10 guests in a master, two double and two twin cabins. On the technical side, this Codecasa is powered by twin 1,650hp Caterpillar engines giving a top speed of 17 knots and a range of 4,000 nautical miles at the economical speed of 11 knots. The Codecasa hull F73 will be delivered this Summer.